I finally have an answer for you to the age-old question: Which is more effective, coaching by telephone or coaching in person? The coaches who prefer coaching in person, invariably assume their way is better. Those of us who prefer to coach by telephone sheepishly counter that coaching by phone seems to work just as well. But is telephone coaching really just as good as coaching face-to-face? After all, we've all read the scientific estimates that up to 90% of the information we receive in a face-to-face conversation is visual, not verbal. 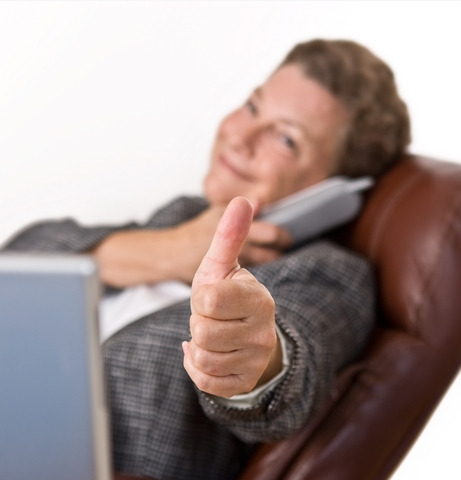 So how can telephone coaching possibly work as well as face-to-face coaching? And from another perspective, face-to-face coaches often brag that they make more money per hour, but do they really? Yes, telephone coaches charge their clients on average slightly less per contact hour, but they also spend less time in non-contact hours. I'll explain: while I don't recommend scheduling your clients back-to-back (a 15 minute break helps you refocus), I've done it and I know lots of other phone coaches who do it and I can tell you that a few hours, earning $300/hour, from my home office on a snowy Monday sure beats traffic jams, commuter trains, crowded elevators and cafeteria lunches, ad nauseum, by a mile. And when you add up the extra time spent in transit, plus tolls, tickets, parking, gas, wardrobe, wear and tear on your car, eating out, not to mention all of the above which also has to be spent on in-person client attraction, versus attracting clients via the internet, I'm willing to bet telephone coaches make more per hour and enjoy more of their working hours with less stress. Remember how up to 90% of information taken in during a face-to-face conversation is visual? That should make face-to-face coaching 10 times more effective than telephone coaching, but it doesn't. Why? Because nearly all of that visual information is unconscious, meaning the coach isn't even aware of it. It gets worse. Many assume that our brains absorb continuous information, like video cameras making a movie, but they don't. Not even close. Your brain takes a couple of snapshots of visual information and fills in (nearly all) the rest with your expectations, assumptions, beliefs, shadows, biases and prejudices. In short, while you're talking to that person, you're taking in some new information from them, but you're unconsciously adding 80-90 times as much information from your past. With telephone coaching, if you're well-trained, you learn to consciously hear more. And if you practice those hearing skills in hundreds of coaching sessions, you develop the kind of hearing - at least for conversations - that usually only the blind possess, meaning you hear far more than most of us ever thought possible. And you do it without adding tons of info from your past. Are telephone coaches completely free of their past assumptions? No of course not; no one is. But a strong case can be made that, because telephone coaching is a skill that's consciously learned from the ground up, the coach is aware of a larger percentage of incoming information, which helps them interface more fully with the present and the uniqueness of their client and the client's situation. Here's an example: I've lost track over the years of the number of clients I've coached who were of a different race, socio-economic background, or sexual orientation, and I didn't know it. I'd like to think that wouldn't make any difference (unless it was pertinent to the topic of the coaching), but I've seen the studies on that and know how unlikely it is that anyone is completely free of biases. Telephone coaching doesn't eliminate all assumptions and biases, but it narrows them down and makes it less likely that a bias or shadow can lurk undiscovered. Here's another reason coaching by phone is more powerful: When using the telephone (or Skype), you can coach with anyone in the world. That means that out of over 7 billion people worldwide, you can match up with your ideal clients and be their perfect coach. Coaching in person is almost always constrained by distance and travel, forcing people to coach with whomever they can find in their home city. You'd think with the ease and low cost of talking via online video, that video coaching would catch on quickly, but it hasn't so far. I'm guessing it's because video tends to highlight the visual in a way that makes it even harder to listen and really hear - and raises the likelihood that unconscious visual information is triggering a conditioned response. I find video coaching more distracting than anything. Last but not least, from the client's perspective, lower prices for telephone coaching, plus higher quality coaching, means a greater ROI (return on investment) for clients. Who doesn't like that? In short: phone coaching is not only just as good as in-person coaching, it's actually better. Do you agree?